Dimensions 1.75 by 6 by 9.25 in. Amazon.com description: Product Description: The most lauded playwright in American history, Eugene O'Neill (1888-1953) won four Pulitzer Prizes and a Nobel Prize for a body of work that includes The Iceman Cometh, Mourning Becomes Electra, Desire Under the Elms, and Long Day's Journey into Night. His life, the direct source for so much of his art, was one of personal tumult from the very beginning. The son of a famous actor and a quiet, morphine-addicted mother, O'Neill had experienced alcoholism, a collapse of his health, and bouts of mania while still a young man. Based on years of extensive research and access to previously untapped sources, Sheaffer's authoritative biography examines how the pain of O'Neill's childhood fed his desire to write dramas and affected his artistically successful and emotionally disastrous life. 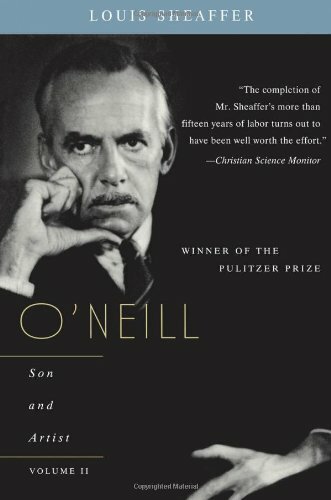 Reprint edition from Ams Pr Inc (June 1, 1988); titled "O'Neill: Son and Artist"
About: The most lauded playwright in American history, Eugene O'Neill (1888-1953) won four Pulitzer Prizes and a Nobel Prize for a body of work that includes The Iceman Cometh, Mourning Becomes Electra, Desire Under the Elms, and Long Day's Journey into Night. from Cooper Square Pub (November 1, 2002); titled "O'Neill: Son and Artist"
Reprint edition from Paragon House (April 1, 1990); titled "O'Neill: Son and Artist"
from Little Brown & Co (July 1, 1975); titled "O'Neill, Son and Artist"